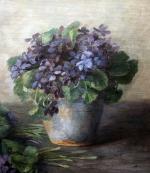 Oil study of violet flowers was executed in the early 20th Century by Berlin painter Ernst Krantz (1889 East Prussia - 1854 Berlin). 1919 he studied by Lovith Corinth in Berlin, where exhibited his works in the Art Union“Novembergruppe”: collective Exhibitionismus the K.-Friedrich-Museum 1912; memory Exhibitionismus theCity Hall Wilmersdorf in 1954. created landscapes, still lifes, portraits and large woodcuts and lithographs. Literature: Thieme/Becker"General Artist Dictionary"(in the biographical info about his father), Leipzig, 1999; Georg Hummel"Leben und Werke des Malers Johann Erdmann Hummel". Technique: oil on canvas, laid down on cardboard. Art Nouveau original period gilt frame. Measurements: unframed w 18 1/8" x h 14 3/4" (46 x 37,5 cm ), framed w 21 1/4" x h 17 3/4" ( 54 x 45 cm). Condition : good original condition.